This is a classic Mexican ranch-style egg dish also referred to as the Mexican all-day breakfast. 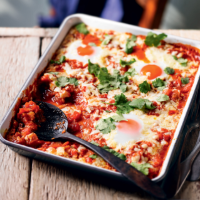 The eggs are nestled in a spicy barbecue tomato sauce and cooked until they are just set. 2. Heat the oil in a saucepan and fry the onion and pepper for 4-5 minutes. Add the fajita seasoning mix and cook for 30 seconds before adding the tomatoes. Cover and simmer for 5 minutes, stirring occasionally. 3. Transfer to an ovenproof serving dish, make 4 hollows in the tomato mixture and crack an egg into each one. Spoon over the salsa and sprinkle with cheese. Bake for 15 minutes until the egg is just set. 4. Sprinkle with coriander before serving. Try serving spoonfuls in soft flour tortillas topped with a spoonful of guacamole for brunch. This recipe was first published in Thu Apr 30 14:34:48 BST 2015.